So let me establish who I am. 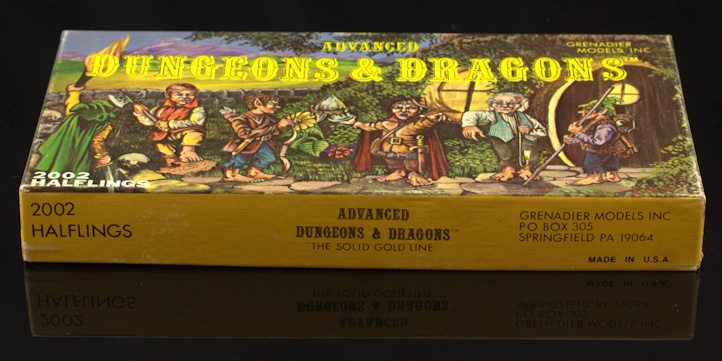 I have been gaming since 1970-something when my Father brought home a blue box Dungeons and Dragons basic set. I was instantly and irrevocably hooked. I got a yellow box of Grenadier Halfling miniatures for Christmas but never painted them since my gaming group didn’t really ever do miniatures — we decided our imaginations were good enough, and our allowances were insufficient to really buy a lot of miniatures anyhow. I wish I still had those models, they disappeared in a move at some point. From then on I was an avid gamer, right through adolescence. After many years of playing roleplaying games, I started my first miniatures game, Battletech. Battletech consumed most of my weekends for years as a teenager, though we didn’t have many of the miniatures, using the cardboard proxies instead. Still, an old Ral Partha Archer miniature is my first painted figure. In college, I worked at a couple of now-defunct game and comic stores, especially the original incarnation of The Source in Minneapolis and St. Paul. I played a lot of board- and wargames with people from the store and with my roommates, especially Avalon Hill games (even Advanced Squad Leader, which the store manager called “Advanced Squad Money”). I also got into painting miniatures for roleplaying games and played some Napoleonic sailing miniatures games using the Heart of Oak rules. The store didn’t heavily cater to miniatures wargamers, more the cardboard chit crowd, so we never had early days Warhammer/40k going on, though I did buy an early box of plastic Space Marines to convert into an idea I had for a sci-fi sports boardgame…which never came to fruition. Then I finished college with a degree in Archaeology and moved on to looking for a job. Long story short (too late), I ended up getting a job in the video game industry. Since that time I have designed games, been a texture artist (not through any real artistic talent), and been, for most of my career, a Producer, both in Publishing and in Development. Along the way I played a lot of games, especially boardgames, but also Mechwarrior: Dark Age, which is at least marginally related to skirmish miniatures wargames. Upon arrival at my current employer, I discovered that the studio has a lot of employees who play miniature wargames as well as a lot of roleplaying gamers. In fact, one of the people who was here when I first joined the studio is the local Press Ganger, and many people in the studio have at least dabbled in Warmachine or Hordes. A few months ago we decided to try Firestorm Armada, and that was my gateway drug. I have always been fascinated with miniature models of many sorts. I would love to have a model railroad someday, and I have great appreciation for things like dioramas in museums. I think it’s a natural progression for me to combine this with my affection for and professional appreciation of games.